Sutro Tower has been sending out notices that it plans to add more antennae to the tower, plus a 30-foot satellite dish on the ground; and do some work around the tower. I hope the work on the ground isn’t going to involve cutting down trees. 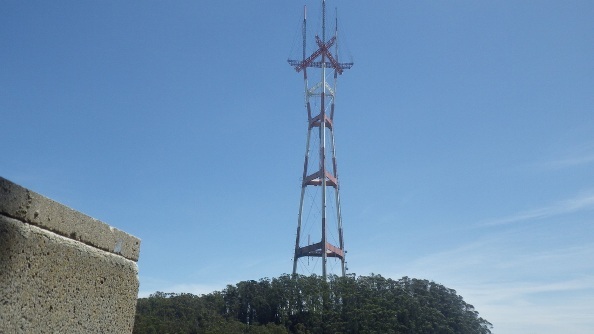 As it is, the base of the tower is overly visible from the Twin Peaks side. It looks interesting and iconic rising above a fringe of green – it’s one of the few objects that can visually dwarf eucalyptus trees! But planted on bare ground, it would look industrial, more like a pylon. 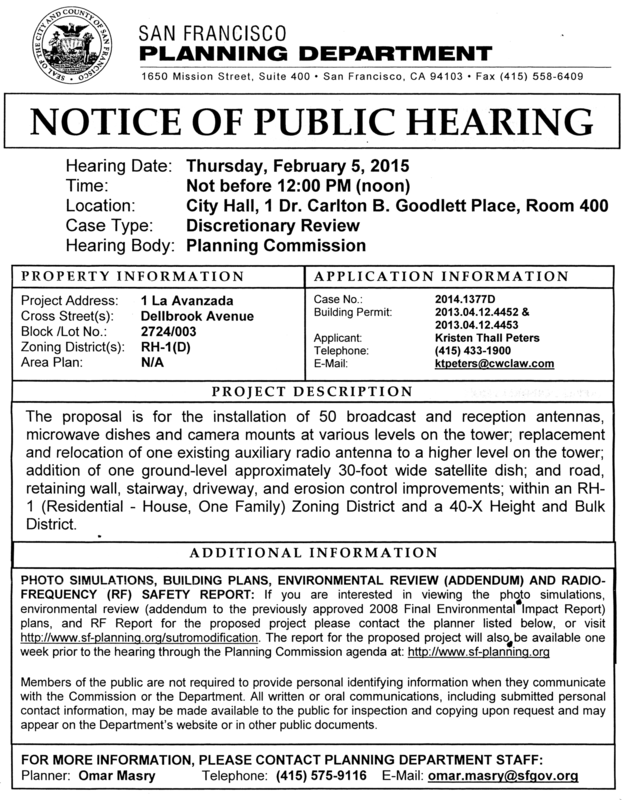 The Planning Commission has a hearing on Feb 5th, 2015. If this is important to you, please write to them about the importance of preserving as many trees as possible, and replacing the ones that are removed with actual trees, not native-plant shrubs or grasses. ← Wrong-side Car – What Would You Do? They shouldn’t do this. The trail around the tower is a longtime favorite hike of mine (as it is with multiple mountain bikers as well). Last time I was there noticed several new signs on the trail but wasn’t sure what it was all about. This is a beautiful so far unspoiled (for the most part) unique forested area where people can still hike and I was hoping it was going to be left as is as it wasn’t exactly in one of the city parks that they are currently trying to wreck by cutting down trails and restricting hiking. What do the people who live in this Midtown Terrace area think about this? Stopping destructive deforestation is more important than adding more dishes, etc. around the tower where it restricts hikers or harms trees or wildlife habitats. This is a special little midcity wild spot, a hike that takes one from Twin Peaks to Mount Sutro Forest, and they shouldn’t close it off any more than it already is. There are enough fences around the area already.